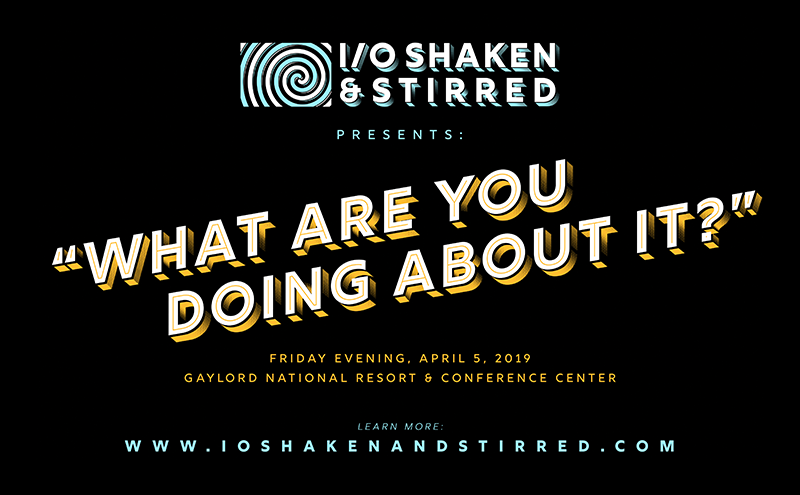 Due to last-minute funding challenges and lack of organizational support from SIOP, I’m deeply disappointed to announce there will not be a Shaken & Stirred event during SIOP’s 2019 annual conference. Shaken & Stirred was created to bring people together from across the field of I-O to be inspired, get engaged, enhance our relevancy, and maximize our impact. It was designed to be an evolving project that provides a place to exchange shared experiences, learnings, and ideas that benefit the field and SIOP. From 2015 to 2017, S&S joined forces with various SIOP committees, SIOP’s Administrative Office, and stakeholders across the field to collaborate and build this innovative new kind of conference experience. Thanks to the input, ideas, and collective energy of so many contributors, the pilot event at SIOP’s 2017 conference in Orlando was a huge success. The result was a wake of enthusiastic demand for more in 2018. Based on the request of SIOP’s conference representatives and desire from members, we quickly went to work preparing our second installment for 2018’s annual conference in Chicago. SIOP wanted us to go big, asking for an evening event that would flow into its own reception. In the summer of 2017, SIOP suddenly changed course. SIOP no longer felt there was a place for S&S at the conference. They pulled their support for the project and began putting up roadblocks. At times there was behavior that was clearly unprofessional. "SIOP no longer felt there was a place for S&S at the conference." However, thanks to the tremendous collective effort of supporters, volunteers, and speakers, as well as external sponsorship support from Google, we were able to overcome these obstacles and independently pull off an exciting new evening event during SIOP’s 2018 conference in Chicago. Sue Ashford presents "I-O Psychology and the Gig Economy" to a packed house at Shaken & Stirred during SIOP 2018 in Chicago. Photo by Ben Hawkes. After the further success of this second installment, it appeared SIOP’s top leaders were more open to our inclusion at the 2019 conference. To enhance the collaboration, the Visibility Committee would partner with us in planning and execution. Once again, work started early to put together the event. For 2019’s theme, we planned to focus on solutions to issues, challenges, and opportunities by asking “What did you do about it?” We were also planning new audience interaction components and a few exciting surprises. Unfortunately, when external funding didn’t come through as expected, we did not have SIOP’s permission to contact its usual SIOP sponsors. That was understandable. However, then the Administrative Office said they could not help us spread the word if we tried crowdfunding the $15,000 needed for the event — not even re-posting our announcement on social media was possible. We had no other way to get our message out to all conference-goers. Our hands were tied. Instead of quietly stepping out of the way, I decided to honor the spirit of S&S and shake things up in a different way by sharing the story of our journey with SIOP. The past four years have shown us the best, and worst, of SIOP. The goal of this article is to share takeaways and suggestions others can leverage as we continue the push for much-needed change within our growing membership organization and its governance. In telling our story, I’ll do my best to share the most important and relevant details, both the good and the bad. Then it’s up to you, fellow I-O colleague, to determine if SIOP can do more to serve our needs and interests. This article will end with a number of suggestions and recommendations to kick-start change. The Shaken & Stirred journey started in 2015. As a SIOP regular since the late 90s, I noticed that as our conference grew in size, people tended to mix less and less while grouping more and more within specialized areas. There was a widening gap between academics and practitioners. Fewer sessions were bringing people together across the field for shared experience and exchange. While always considering myself an engaged member of the community, SIOP was to me – like it is for too many practitioners – a fairly small part of my professional identity. But I had a growing concern there wasn’t enough connective tissue between what my academic colleagues were researching and how their work could be applied to the leaders I consulted in the working world. The scientist-practitioner model is our field’s special sauce. It differentiates us and significantly enhances our impact and influence in the world. However, the larger we get the harder it is to truly connect. How could that connection be strengthened at our annual conference? Large-scale change would need to be driven by SIOP insiders, and I was most definitely not an insider. How could I make a real difference? We needed an event full of high-quality content that also had enough spectacle and excitement around it to attract people from across the field. We needed something that was fun and provocative, that inspired and engaged people, and that would hopefully light a match leading to more member connectivity and exchange. An event from the SXSW Interactive conference called 20x2 provided the perfect inspiration. For 20 years, these increasingly popular events have been held at live performance venues after the conference program. A host emcees the event with 20 presenters, each getting two minutes to answer the same, seemingly simple question. By adapting the 20x2 format for the I-O audience and conference, we realized we could curate a wide and diverse range of presenters covering an even more diverse range of topics relevant to our field. We landed on the question “What if?” and Shaken & Stirred was born. In the summer of 2015, I reached out to SIOP and was connected with Zack Horn, the pioneering Program Chair in-training for the 2017 conference in Orlando. With Zack’s help, enthusiastic support from the Special Events committee (shout out to Madhura Chakrabarti and the great catalyst Aarti Shyamsunder), support from the Administrative Office, and input from stakeholders and committees across SIOP and beyond, we would be able to push the boundaries of both the field and our conference. It took almost two years of development to try a condensed, experimental version of S&S in Orlando. While SIOP leadership decided we couldn’t do the event in the evening or with a cash bar, the expectation was that if this 2017 pilot proved to be a hit with the audience, we could hopefully do the full evening experience in 2018. In the meantime, we would create an afternoon event to gauge interest in this new format among attendees at 2017’s annual conference. Our strategy for S&S included a mission and vision for a long-term project with events that would evolve over time. Depending on interest and perceived value, the plan was to utilize the one-question-in-two-minutes format for a few years. After that, we’d either change up the content or pass the project on to a new curator so their fresh ideas and energy could benefit the field of I-O and SIOP. To enhance engagement and communication around the event, we created a brand, content, website, and social media strategy for the event. For the pilot year, SIOP helped by hosting the S&S content on siop.org. Meanwhile, we also built out platforms on Twitter, YouTube, LinkedIn, and Facebook. A team of volunteers also signed on to help with program and event management. The pilot event's website and Twitter page for SIOP Shaken & Stirred 2017. Since it seemed like best practice at the time, we made an agreement with SIOP that S&S would own all intellectual property, including the event’s name, content, and marketing assets. Later, this would prove to be prophetic and save the event. We wanted to ensure the event wouldn’t be assimilated into a sanitized session or be used to put forward the same well-known faces saying similar things year after year. While we absolutely want to showcase the ideas of big, recognized names in our field, we strongly believe it’s just as important to introduce new faces and ideas. We gathered ideas and suggestions for potential speakers from far and wide and worked hard to put together a compelling mix of speakers and topics from across I-O and even some non-I-O leaders and innovators. Invited speakers were told they could answer the “What if?” question however they chose as long as it related in some way to the world of I-O and was crafted to help the audience think bigger, challenge their assumptions, and/or broaden their perspective. Late in the afternoon of April 28, 2017, we were finally put to the test at SIOP’s annual conference in Orlando. The energy and excitement in the giant ballroom of the Swan and Dolphin Resort were palpable. After two years of planning and incredible team effort, our unorthodox experiment for a new type of conference event was proving to be a big success! SIOP Shaken & Stirred 2017: Some audience members arrive early as the countdown clock ticks away. A red carpet was rolled out as an unexpected surprise by SIOP’s Outgoing Executive Director Dave Nershi. Photo by Zack Horn. Hundreds of people showed up from across all areas of our field. The audience was hearing ideas and listening to people they would otherwise not be exposed to at SIOP. People were streaming in throughout the session as they were being texted by others that they couldn’t miss this event. The outgoing Executive Director of SIOP even surprised us by rolling out a red carpet! This was not a session — this was an event. Where else at our conference could such a broad cross-section of our community hear Mikki Hebl call out the lack of women and diversity among SIOP’s new fellows and award winners — complete with a mic drop? (Of note, the very next year saw a dramatically visible shift in the representativeness of new fellows and award winners.) Where else could people be challenged to think differently about journal editing by Steven Rogelberg, to consider what the ultimate situational judgement test might look like with Ben Hawkes, or to utilize I-O Psychology to eradicate global poverty with John Scott? Where else could so many be introduced to phenom Mike Morrison as he tackled the possibility of a universal wage? Check out the full list of 2017 speakers here, and watch many of the pilot event’s fantastic presentations. We also used this event as an opportunity to share information about SIOP and introduce the audience to as many committees as we could. In lieu of an intermission, we hosted an “Idea Break” to harness the audience’s creative energy and gather ideas for the benefit of SIOP committees. Shaken & Stirred 2017 speakers and event team from left to right: Meghan Pickett, Ben Taylor, Mike Morrison, Alexis Fink, Steven Rogelberg, Amy Grubb, John Scott, Megan Nolan, Tom O'Neal, Katina Sawyer, Derek Avery, Jennifer Weiss, Kathryn Dekas, Aarti Shyamsunder, In-Sue Oh, Ben Hawkes, and Cristina Neacsiu. Not pictured: Mikki Hebl and Doug Reynolds. Photo by Barbara Ruland. Around this same time, the motto “Team SIOP” was coined by Fred Oswald. Our experience had certainly embodied that idea. S&S 2017 was successful because of the input, ideas, collaboration, and collective energy of so many talented people. We kept hearing S&S 2017 was one of the most popular and highest rated sessions of the year. So much so that in the weeks that followed, SIOP conference representatives asked if we could do it even bigger at the 2018 conference in Chicago. They envisioned an evening event flowing into its own reception. The audience would not only hear new ideas but there would also be social mix-and-mingle time for new connections to flourish and grow. We were unaware and completely unprepared for the institutional resistance and ironic obstacles that lie ahead. After the success of 2017’s Shaken & Stirred pilot in Orlando, SIOP asked us to create a conference-wide crossover event between daytime and evening events. Presenting the event to such a large audience had never actually been part of the project vision. We envisioned more intimate environments where people and ideas are likely to mix. Knowing this kind of thing isn’t for everyone, we wanted people to come who were excited to be part of the experience. That said, this was a tremendous opportunity to bring our diverse community together and expose people to new and different ideas. We dove in. Instead of working through committee representatives like the year before, SIOP asked me to directly facilitate S&S planning by serving as a member of its Special Events committee. We were once again collaborating across the organization and beyond to get ideas and feedback. By the summer of 2017, we already made great progress toward a meaningful and substantial 2018 event. During what was to be a routine planning call in July of 2017, a startling message was shared by the new Program Chair: SIOP was no longer sure there was any place for S&S at the conference. Behind the scenes, a new Executive Director was starting at the Administrative Office and new SIOP leaders were just beginning their terms. It was communicated to us that there was now “internal resistance” to S&S in any form, even as a Special Event. This was our first indication that there were people of influence who did not want what S&S was offering at SIOP. While the exact nature and sources of concerns remain murky to this day, it was eventually communicated through formal channels that SIOP’s main concerns with including S&S at the 2018 conference were cost, space, and fairness. OK, we could tackle the cost and space concerns, especially if folks in SIOP were open to creative problem-solving. But fairness? That was a head-scratcher. S&S was a multi-year project, and its SIOP-sponsored pilot event was a huge success. The whole point of the pilot was to gauge whether the I-O community would find enough value in the session to grow it into an evening event, and it was reportedly one of the highest rated sessions of 2017. Further, S&S was proactively inclusive across all areas of SIOP. It had a team of devoted volunteers and supporters ready to help in any way possible, and we had put hundreds of hours into it already. We’d even built a website and designed strategic PR and social media campaigns that were growing in followership. The SIOP community loved it and was expecting more. So, “fair” to whom or what? Fair to hypothetical sessions or events that had not been conceived? As we scrambled to navigate this abrupt shift, all interactions with SIOP were suddenly strained. Where we previously enjoyed collaborative and open communications with SIOP committees, leaders, and the Administrative Office, I was now instructed to only speak to the current or previous Program Chair about S&S. Meanwhile, my calls and email to the Special Events committee, of which I was a member, asking for help and guidance went unanswered. Shortly after that, my membership on that committee dissolved, as if it had never happened, without any discussion or explanation. During this time, we also learned staff in the Administrative Office had been instructed not to speak to us. This was a big, red flag. Why would it ever be OK to instruct staff at the Administrative Office not to speak to a member — and with no justification? Around the same time, the previous Program Chair suggested that if we got external sponsorship, SIOP might be more interested in partnering again. Within days of contacting speakers from the S&S pilot in Orlando to get their suggestions, we heard from multiple organizations who were interested in sponsoring the event. We included these options in the proposal. We thought we successfully addressed all of their concerns. But SIOP got back to us saying we were not allowed to use sponsorship in this way for a SIOP Special Event. Instead, they asked us to hold S&S as the last 50-minute session of the conference program, which would increase attendance for the Closing Plenary. They said we’d need to clear the room out after exactly 50 minutes, and then audience members would need to wait in the lobby for 40 minutes until doors opened again for the Closing Plenary. When we asked if coffee could be provided in the lobby area to create a social space during that time, the answer was no. SIOP said they would not pay for it, and sponsorship would be too tricky vis-à-vis SIOP’s bylaws. And, no one was interested in brainstorming other alternatives. Even though this short and rushed format moved further away from S&S’s vision as an event, we wanted to be flexible partners and add value. We simply asked for clear agreement that in return for creating an abbreviated, regular conference session for 2018, SIOP would commit to working with us to create a full evening event in 2019. For SIOP, this was not possible. Therefore, we decided it would be in everyone’s best interest for us to work with a third-party sponsor to create the kind of new event we knew conference attendees wanted. We were sensitive to SIOP’s financial interests and determined the best path forward would be working with a sponsor who had never sponsored a SIOP event before. That sponsor turned out to be Google, who wanted to contribute to something new and innovative for the I-O field. Once again, we thought we found a win-win for everyone. After all, an event like S&S, especially with a Google partnership, is the type of attraction that elevates and adds cachet to the conference and profession. It enhances member engagement across our varied community and serves as a genuine value-add. It contributes to SIOP’s mission while enhancing visibility. We truly expected SIOP to see the strategic benefit of what we were creating and assumed it would be much easier to work collaboratively again moving forward. But then things got even more strange. When we contacted the conference hotel and their audio/visual company to start planning and get the event estimates needed by our sponsor, we were told they were not allowed to speak to us without explicit permission from the Administrative Office. When we tried to get that permission, the Executive Director simply communicated through the Program Chair that he estimated the cost of our evening event would be in the “six figures”, and they were too busy at the Administrative Office to contact the hotel. Six figures? Did SIOP’s Administrative Office think such an answer was appropriate or anywhere near accurate? S&S found solutions to all of SIOP’s stated concerns about the event and were ready to move forward. We were also bringing in Google as a new sponsor for SIOP. SIOP’s Administrative Office was quoting an outrageous estimate for the cost of the event. The only thing needed was someone within SIOP’s Administrative Office to email the conference planner at the Sheraton and tell her they could talk with us. One sentence is all we needed to proceed with planning and get realistic cost estimates, but the Administrative Office was reportedly too busy to send such a communication for the foreseeable future. We were stuck in limbo and our sponsor needed definitive numbers. When our emails and phone calls through SIOP’s requested chain of command were not successful in breaking through these latest obstacles, I had no choice but to breach their requested protocol and write directly to members of the Executive Board. I explained the situation as best I could, pointing out that an event like this is a strategic opportunity directly aligned with SIOP’s mission, vision, and goals. We were creating something of great value and doing all the work, without SIOP having any burden or risk. SIOP also didn’t have to pay for anything. Meanwhile, we were inviting SIOP to be involved to whatever extent they wanted and to integrate it into the conference however they saw fit. What I really hoped was that the Executive Board would learn about the unfounded six-figure estimate and the blocking of permission to talk to the hotel and do something about such unprofessionalism. I also hoped they would recognize this was a uniquely valuable and beneficial partnering opportunity worth investing organizational positivity in, if not actual resources. After several exchanges with the Conference Chair, the Board apparently met and discussed the issue. While there is no record of it in any of the Executive Board reports, they told the Administrative Office to let the hotel speak to me. While it had taken a baffling amount of effort to get there, we were pleased to be able to finally move forward again. SIOP decided S&S was to be treated like an “affiliate” event — essentially the same as an evening party or event held in the conference hotel that’s sponsored by another organization (i.e., company and graduate program parties). Whatever decision making and influence wielding occurred behind the scenes is still murky. For example, we have no idea who, if anyone, received or read our proposal. We don’t know who was behind the sudden “internal resistance”. We also don’t know if anyone realized the inappropriateness of dissolving my role on the Special Events committee without notice or explanation. Like all members, I can access committee and board meeting reports and minutes through the Governance section of my.SIOP. This helped answer some questions while raising others. For example, SIOP’s Program Committee’s own strategic goals throughout that conference year included “Allocate program time to special events, like Shaken and Stirred”. During this same timeframe, the SIOP Conference & Program Charter Taskforce was finishing a review of the previous five years of conference and program activity. Their purpose was to make recommendations for the next five years of SIOP conferences. In regard to innovations that have improved the conference experience, one of the first things mentioned was Shaken & Stirred. As for the Executive Board, there is no record of discussion about S&S during any meetings that year except one. At the December 2017 meeting, the Conference Chair gave an update on plans for Chicago 2018 and said, “We are trying to figure out how Shaken and Stirred might be integrated into the program.” That was news to me. The exchanges mentioned earlier happened by late October. While we offered to work with SIOP leadership time and time again — on their terms — we had not heard from them. One big concern surfaced in February 2018 that requires description. We were in negotiations with the hotel and its audio/visual company. Even though our sponsor was remarkably generous, we were trying to cut the fat wherever we could. There were some line items in our estimates that were nice-to-haves but were not necessary. For example, we didn’t need fancy backdrop curtains and special uplighting that cost thousands of dollars. When we asked the vendor to cut those items, they said they could not. SIOP’s Administrative Office had set it up with vendors so our self-funded, unsupported event was shouldering half the costs for the elaborate stage design elements used in SIOP’s Opening and Closing Plenaries. So, SIOP’s Administrative Office financially benefited directly from S&S? Without our being informed or giving consent? And without our sponsor’s consent? This was definitely not appropriate. Was it even ethical? We don’t know if these financial decisions were intentional or the result of a serious lack of administrative oversight. What we do know is we tried to get the attention of key representatives several times to discretely discuss the situation, which received no response. We also mentioned it in our last proposal. No one has followed up with us. After SIOP’s Executive Board told the Administrative Office to allow the hotel and vendors to speak to us, we got busy planning once again. Fortunately, people in SIOP’s subcommittees and affinity groups were eager to contribute and share their ideas for speakers and topics, and the Visibility subcommittee became particularly engaged in our efforts. In the weeks leading up to the 2018 conference we made the big announcement through social media that S&S would be an exciting new evening event and people could reserve free seats through Eventbrite. The positive response was swift. With nominal marketing, all 500 seats for the event were reserved in just two weeks. After asking the hotel to add another 200 seats, those were quickly snapped up, too. A waiting list was created that ended up with more than 200 names on it. 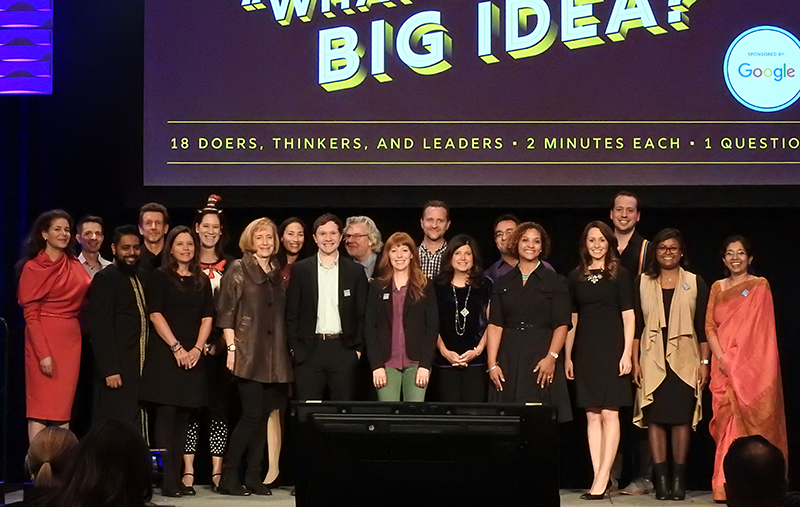 The theme for 2018 was “What’s the Big Idea?”, and we presented a lineup of 18 thought-provoking speakers as well as libations, music, and a few surprises, including a marching band. The 18 speakers were outstanding. Once again, where else at our conference would such a broad cross-section of our community be challenged to think differently about how we teach I-O by Ron Landis, to imagine working life on Mars by Leslie DeChurch, or explore how I-O and data scientists can learn from each other by Nathan Mondragon and Lindsey Zuloaga? Where else would you find hundreds of SIOP members learning from The Second City’s Kelly Leonard how improv can be used to create better workplaces? See the full speaker lineup. If you missed their presentations, be sure to watch videos of all speakers on our YouTube channel. Shaken & Stirred 2018 speakers from left to right: Jennifer Weiss, Brian Welle, Sy Islam, Stuart Carr, Cristine Porath, Nicole Dessain, Susan Ashford, Asia Eaton, Mike Morrison, Kelly Leonard, Lindsey Zuloaga, Ron Landis, Leslie DeChurch, Nathan Mondragon, Kizzy Parks, Tiffany Poeppelman, Thomas Sasso, Tatiana Arthur, and Aarti Shyamsunder. Photo by Ben Hawkes. We had an even larger team of volunteers for 2018. They worked serious magic in coordinating such a complicated event, including social media that was afire leading up to and following the event. Many audience members reached out afterward offering their appreciation for the project while indicating they want more S&S and events like it in the future. Unfortunately, there was a great deal of confusion leading up to and during the conference about why SIOP wasn’t mentioning anything about S&S on their website, in their program, in email or social media, etc. People were frustrated when they learned they had to reserve seats but had not received an email or communication about this from SIOP. All S&S could do was send information to our direct contacts and post it to social media. SIOP would not re-tweet, re-post, or make any mention of the event. We also did our best to encourage speakers and volunteers to forward information to as many people in their networks as possible. Sadly, many people assumed the lack of information was an oversight or the result of poor planning by the S&S team. We reached out repeatedly to SIOP leaders suggesting easy ways they could help the situation and how some communication to conference attendees would be beneficial for everyone. The answer was always no. The tenor of their responses suggested SIOP thought we were trying to self-promote or get something we didn’t deserve. We hoped the clear success of Chicago’s 2018 Shaken & Stirred event would lead to more openness and partnering by SIOP. Surely SIOP leaders would now see the value S&S adds to the conference and the benefits it provides our field! Following the Chicago conference, things were indeed looking good. The new Program and Conference Chairs for the year were eager to work together and asked us to provide another proposal for 2019. We were also working closely with the Visibility committee, led by the extremely talented Nikki Blacksmith, and hoped to collaborate even more with them in the coming year. Once again, we created a comprehensive proposal for the 2019 conference. We still weren’t sure who was receiving or reading these documents — let alone what information or how much convincing they needed — so we laid everything out in detail. We wanted to make sure they understood the purpose of the project and how it provides genuine impact for many in the community. We also included plenty of options and ideas about how we could work with SIOP to further evolve the event. We even included ideas for a non-alcoholic event, as well as one that served as a fundraiser. “We understood SIOP might acknowledge S&S at the 2019 conference by listing it as a special, sponsored evening event the way other sponsored events are announced." After a couple of months, we heard back. SIOP decided they wanted S&S to once again remain an “affiliate” event, stay completely separate from SIOP, and find our own funding. That said, we understood SIOP might acknowledge S&S at the 2019 conference by listing it as a special, sponsored evening event the way other sponsored events are announced. Plus, the Visibility Committee would formally partner with us in planning and execution, and they even secured $1,000 in their budget for S&S’s printed programs. Once again, work started early to put together the 2019 event. For 2019’s theme, we planned to focus on solutions to issues, challenges, and opportunities by asking “What did you do about it?” New twists and surprises would be added to enhance the audience experience and engagement. For example, we were planning new audience interaction components and setting up a special surprise guest who would be especially relevant to the I-O audience. We worked with the hotel and its vendors to nail down estimates and book the large ballroom at the Gaylord National Resort for Friday evening on April 5. Even better, cost estimates were under $15,000 — significantly less than the total cost for 2018’s event in Chicago. Given this, we figured our chances of securing funding were good. Shaken & Stirred, 2019's event announcement that wasn’t to be. Through the summer and fall of 2018, it looked like our funding needs would be covered. Then our sponsor’s ability to fund external events changed. Thankfully, another potential sponsor stepped forward right away. Things were looking good until January when we received the bad news that they could not sponsor an I-O event. Uh-oh. We didn’t have funding after all, and the event was fast approaching. We didn’t have permission to reach out to SIOP’s usual sponsors, so I sent a note out to our S&S community of past speakers, volunteers, and some supporters in case they or someone in their network could help. When that didn’t work on such short notice, I reached out to SIOP leaders asking if they had any suggestions. In that email, I mentioned crowdfunding had been floated as a possibility. I didn’t hear back from anyone except the Executive Director, who said crowdfunding sounded fine. With just over two months left, we’d need SIOP’s help getting the word out to the entire community. I asked if SIOP would re-post our social media announcement about crowdfunding. Sadly, their response was “no”. We had no other way to reach all conference-goers. And with that, the light of S&S was stamped out. S&S installments have even inspired spinoff collaborations and events. For example, audience input from past S&S events was provided to SIOP committee representatives for the enhancement and improvement of their own efforts. We’ve been contacted by several organizations and individuals interested in utilizing the S&S format for their own special events (e.g., 2017 Reversal Theory conference, People Matters TechHR 2018 conference in India, the National Center for Healthcare Leadership, etc.). We also just learned SIOP’s own WIN committee will present a collaborative 2019 Executive Block conference session with CEMA and LGBT based on S&S, titled What We Wish Our Allies Knew. S&S speaker topics each year have also led to a number of full program sessions at subsequent SIOP conferences (e.g., The Future of Work: Bright or Bleak at SIOP 2018 and Beyond Neurotypical: Maximizing Performance through Diverse Talent Management at SIOP 2019). As for videos of S&S presentations, we’ve heard of professors who utilize videos from the S&S YouTube channel in their classes for discussion. Some videos have received significant online attention. For example, Christine Porath’s S&S presentation, Civility in the Workplace, has been viewed more than 1,000 times, and John Scott’s Project GLOW video, has been viewed more than 1,500 times. Why write all this down to share with others? Because it raises important questions about our professional organization and its governance. What does SIOP really stand for? Who does it really serve? What does it really want to be? And how does it need to govern itself to get there? For 20 years, I’ve called SIOP my professional home. Shaken & Stirred was my way of giving back to this community, and it was brought to life by the incredible talents of everyone involved. But sadly, its success was met with negativity and resistance from a few powerful and influential sources within SIOP. Yes, there are extremely well-intentioned and talented leaders within SIOP who care about the organization and want the best for its future. There are many people involved in the organization across all areas and levels doing excellent work. But the organization’s governance and leadership culture are not necessarily evolving and meeting member needs in our fast-changing world. The S&S journey has surfaced some weaknesses in our professional organization, and the lessons we have learned highlight the need for change. If you want to see changes from SIOP, here are some suggestions and recommendations for member-driven change. First, if you believe events like S&S are valuable to the I-O field and are disappointed S&S isn’t happening in 2019, let SIOP know. If you think our annual conference benefits from events like this that attract people from across I-O and exposes them to new and different ideas, be sure SIOP hears you loud and clear. Don’t wait for the post-conference survey, which does not measure this type of thing. And as for the write-in responses, it appears the only analysis they receive is in the form of a generic word cloud of common words like “session” and “sessions” (see Figure 1). 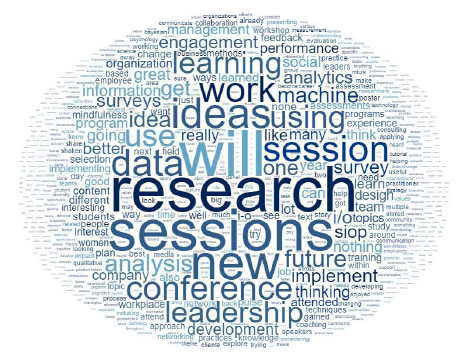 Figure 1: Word cloud analysis of conference ideas from the SIOP 2018 Post-Conference Survey Report. As far as we can tell, this is the only analysis conducted on written responses. Instead, write to SIOP (e.g., tweet and tag SIOP, post on LinkedIn and Whova, and e-mail the Executive Board) to share your thoughts and expectations. And be sure to talk about the loss of this kind of event with your colleagues as well. Strong member sentiment on topics gains SIOP’s attention and leads to quicker change. Are you craving more diverse speakers and topics at our annual conference? More thoughtfully curated content rather than the same groups of people joining together for similar sessions year after year? Are you looking for richly meaningful and relevant experiences and content that don’t necessarily fit the old-school conference norms and structure? A whole separate article could be written about how content is generated for the conference program. Such an article could examine the quality of content that results from the current approval process as well as the friction new and nontraditional concepts encounter through the process. At first glance, the way the proposal and peer review process is set up seems like rigorous best practice. Given a closer look, you’ll see the way it’s done misses many opportunities to deliver sessions that are thoughtfully curated, highly relevant, proactive in blending science and practice, and inclusive of fresh perspectives alongside traditionally common voices. While some conference redesign should be considered, a more realistic ask is for a cross-disciplinary panel to provide checks on the quality of reviewer assessments while balancing the depth and breadth of various content areas. This panel could even get time on the conference schedule to deliver programming that addresses content gaps, emerging trends, and developments that may not have existed months ago when proposals were submitted. For example, you’d hardly know by looking at 2018’s schedule that #MeToo, #BlackLivesMatter, and public awareness of the extent of harassment and inequalities in the workplace were now prompting an increasing number of daily headlines and boardroom challenges. And how about suggesting new session formats, such as researcher/practitioner collaboration forums? Imagine a format where researchers briefly describe projects, and practitioners provide input regarding how the research can be honed to increase its relevancy in the field. Or where practitioners briefly describe a workplace challenge, and researchers recommend existing research and its application to the challenge. This could lead to real-world collaborations between researchers and practitioners in ways that benefit us all. And what if the last hour of every conference program day is utilized for a featured event, like TEDx-style talks, where everyone convenes in a large ballroom with no competing sessions? What a powerful shared experience for the entire SIOP community! Sure, it would involve extra funding, but it could easily attract sponsorship. If done well, it would be a smart use of resources and time that would pay off exponentially in added value, engagement, visibility, learnings, connection, and community. Also consider encouraging SIOP to re-think its conference content areas. If you look carefully at today’s content areas (Figure 2), you’ll notice there are no big-picture, cross-field options. If you want to put together a cross-disciplinary event along the lines of S&S, it won’t fit into any of these categories. These are mostly niched subject areas that appeal to subsets of our community. While it’s important to provide space for these areas of specialization, it’s also important to create content and settings that bring people together to exchange learnings and gain exposure to new ideas. Yet there is very little flexibility in the process. You might get lucky, like we did, by gaining supporters who can maneuver the system for a given year by giving you Special Event status. But the next year you’re just as likely to be impeded by status quo thinking, bureaucratic red tape, lack of transparency, and organizational politics. 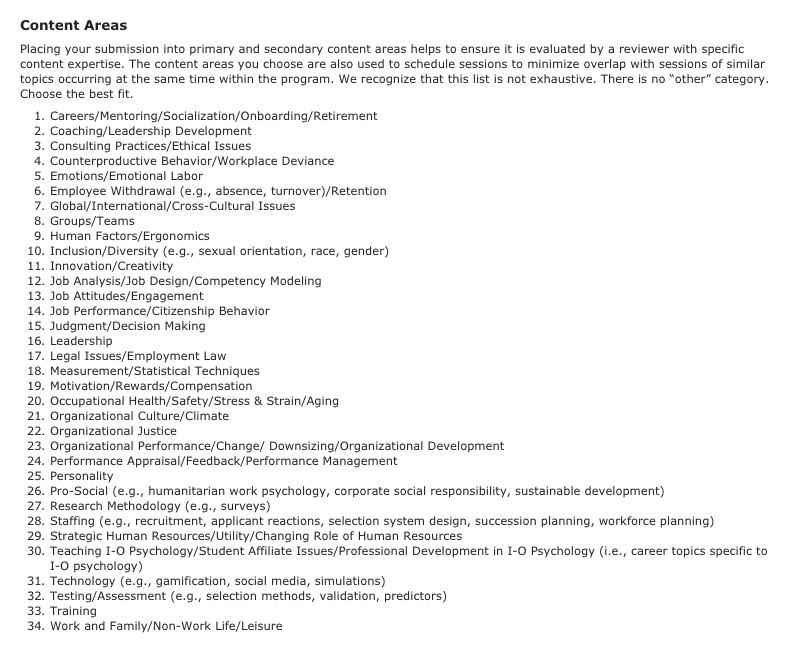 Figure 2: Content Area options for SIOP’s annual conference offer many specialties and sub-specialties but no big-picture, cross-field options. If nothing changes for the 2020 conference’s content decision process, how about really shaking things up? If your innovative, nontraditional, or otherwise thoughtful proposal for a conference session gets rejected because only one reviewer didn’t like it, post the results on social media. Let people see how the current algorithmic approach is really working. While on the topic of the peer review process, keep in mind that some of the most meaningful content will, by its very nature, elicit negative reactions in some people. If the goal is to please everyone all the time, we haven’t learned anything from our own research and are instigating our own irrelevancy. In the meantime, be sure to give SIOP positive reinforcement when constructive change occurs. When you appreciate a new kind of event or benefit from a particularly high-value session, share your praise liberally and across platforms. If you think they’ve made a move in the right direction but want more, share that, too. For example, this year SIOP introduced a proposal option for Cross-Disciplinary Sessions. This appears to be an effort to increase idea exchange with others who are not explicitly I-O. Considering how our work can and should impact and interact with all aspects of the working world, this certainly seems like a good idea. That said, the Cross-Disciplinary Session requirements are onerous. They still require any invited speakers to register and pay for the conference. This diminishes the likelihood of attracting high-value guests and their contributions to SIOP. It’s certainly a step in the right direction, so let SIOP know if you’re happy with the change and want them to go one step further next year. Do you know who is running for elected office? What’s their background? What do they stand for and how do they plan to impact SIOP? What’s their motivation? Are they going to advocate for real change, and do they know how to lead it? To what degree are they knowledgeable of the needs and realities of members across the I-O field? One way we can all play our part is to do our homework and raise our own expectations of SIOP and its leaders. Like other professional organizations, leadership positions at SIOP tend to be very short, often lasting only one year at an “acting” capacity. Not surprisingly, such short tenure promotes a short-term focus and often rewards small wins. Currently, there’s little to be gained and much to be lost for leaders who advocate for an ambitious vision of the future or attempt to drive significant change. Instead, successful SIOP leaders are usually deferential to the roles and hierarchy of the governance structure and are sensitive to staying in their own lanes. Rocking the boat is definitely not rewarded. There tends to be an aversion to conflict and significant diffusion of responsibility, which is a recipe for staying stuck with the status quo. This is troubling since that status quo is no match for today’s world of ever-accelerating change. Unfortunately, the short-term nature of roles also hinders cross-collaboration and strategic impact. Officers can talk the talk and emphasize win-wins, but without leadership that is both courageous and collaborative as well as long-term in focus, SIOP cannot live up to its stated goals and mission. We should look for leaders with a long-term view for SIOP and our field who have experience and background equipping them to execute that vision. We should support leaders whose actions demonstrate they value diversity of perspective. We should look for leaders who embrace SIOP’s research/practice model and who are committed to proactively nurturing that dynamic. Above all, we should resist leaders who fuel a culture of us vs. them within our community. Review board minutes and committee reports! They’re available to all members at mysiop.org. Are you satisfied with what’s being discussed at these meetings? Are your interests being represented, and are your expectations being met? Are important goals being tackled for both the short and long term? Are leaders effectively stewarding the future health of our membership organization? If SIOP leaders answer this call by merely drafting another policy or statement and adding it to the website, then they’re not leading effectively. This is also not solved by simply creating an ad hoc committee or conducting another survey. Surveys can be useful, but if you take a close look at reports from SIOP’s various surveys you’re likely to be concerned by the quality and interpretation of results. Survey research is one of our specialties, after all! Speaking of I-O specialties, we should require the Executive Board to regularly conduct self-evaluations with input mechanisms from the I-O community. Although methodology should be shared, results should not be made public. But good governance requires ongoing critical analysis of what is working well, what’s not, and whether leaders’ actions are in the best interest of both the short- and long-term health of the organization. Similarly, we should urge the Executive Board to conduct meaningful Executive Director evaluations to help ensure the Administrative Office is being led in a way that respects members while representing our interests and the needs of our industry. We have plenty of subject matter experts who specialize in leader evaluation and could certainly lend a hand. Perhaps it’s also worth asking what role The SIOP Foundation’s Board of Trustees plays. To what extent, if any, are they influencing the Executive Board and the overall culture of SIOP? Are there appropriate separations of interest and role boundaries? And are there any other stakeholders who potentially wield strong influence behind the scenes that members should know about? One large and understandable barrier to change is funding. SIOP is challenged as an organization to take on large projects due to financial constraints. While some of us would consider spending more money for conferences and member dues in return for high-value content, others would find that challenging. Instead, how about thinking of new revenue stream opportunities for SIOP? Does anyone have suggestions from other professional membership organizations or other divisions of the APA? There is also the obvious suggestion of encouraging SIOP to get behind forward-thinking efforts and use them to attract more sponsors. For example, SIOP could have included S&S in its Partnership Prospectus as suggested in our 2019 proposal. Many organizations want more from their sponsorship dollars than their name on a banner or bag. Creative, buzzworthy partnership opportunities for sponsors would likely bring in more funding. If you want to see changes, consider getting directly involved and find your own ways to give back. There are some fantastic SIOP committees, and many of them enthusiastically welcome interested members and students. For committees that aren’t open, let the community know it through social media. It doesn’t serve our interests to have closed cliques of people in charge. Take a grassroots approach and speak with others about who to nominate for elected office. It doesn’t take much to get on the ballot. And for those further along in their career, consider getting involved with the Foundation. They may have more influence than most realize, and this influence will likely expand along with their asset growth. Stretch and reach out to others with new ideas. Even something that seems a little out of the box can lead to something exciting with a little collaboration. Sometimes you have to go through a few no’s to get to yes, but it’s often worth it. Finally, please share your own ideas for change! This article is meant to start some much-needed conversation. Hopefully this is just the beginning. Spread your recommendations and suggestions on social media and Whova. Write your own blogs or articles. And wherever possible, be sure to use tags like @SIOPtweets, #IOPsych, and #SIOP19 for the benefit of SIOP and the I-O community. Just like any other organization growing in size and scope, we need to proactively evolve our culture and leadership for it to be relevant and effective. This could start with reevaluating SIOP’s purpose and what it is meant to achieve. One way to clarify the organization’s purpose would be to revise the vision statement. The current vision statement reads: “To be recognized as the premier professional group committed to advancing the science and practice of the psychology of work.” It’s not highly aspirational, and it’s passive rather than proactive. The current statement is about perception instead of actually leading, executing, and making an impact. Instead, how about crafting a compelling vision that draws us together and inspires action? Imagine if it read something lofty like, "To combine the best of science and practice for the betterment of humanity and its institutions through the study and application of work and organizational psychology." Such a statement could be an anchor as well as a measuring stick. Then, the mission and strategic goals could be clarified and connected to this larger vision and then cascade through the governance structure. Are there four? The official roster for SIOP’s Executive Board and Committee Chairs lists four members under “Executive Board”. Or are there 16? SIOP’s Administrative Bodies Guidelines, which directly reference the bylaws, state “The members of the Executive Board are President, President-Elect, Past President, Financial Officer/Secretary, Division Representatives to APA Council, Conferences and Programs Officer, Publications Officer, Communications Officer, External Affairs Officer, Membership Services Officer, Professional Practice Officer, Instructional and Educational Officer, and Research and Science Officer. The Executive Board is elected by the membership and has general supervision over the affairs of the Society. At its various meetings, the Executive Board makes policy and decisions by majority vote.” Assuming there are four Division Representatives to APA Council, does that mean the Executive Board has 16 members? So, which is it? The differences there are quite significant. No matter the number, does the Executive Board structure effectively represent member interests, and is it leading to the best decisions for our membership organization? There are also so many SIOP groups and committees that it’s hard to keep track of them all. Some are outdated, some are marginalized, others overlap, and most lack liaising mechanisms with other committees and with leadership. Our committee structure is very much like our website. As it grows it becomes an ever-expanding repository rather than being periodically restructured and fit for purpose. If the updated purpose drove a new how (i.e., governance and policy), the structure could be revised in a more efficient and nimble manner. SIOP is a multi-faceted organization built on important tradition and protocol, but like all organizations, it must learn and evolve to stay relevant. Hopefully sharing the experiences of Shaken & Stirred helps tear down some walls and engage collective action for improvements in a professional organization that’s meant to represent our needs and interests. Hopefully this article also honors the legacy of Shaken & Stirred by inspiring, educating, and stretching the I-O community so we can have more impact and influence moving forward. And on the evening of Friday, April 5, if you feel something is missing from your conference experience, take a peek into the big empty ballroom and start imagining what you want to see on that stage in the coming years. Special thanks to the two SIOP colleagues who reviewed painstakingly long drafts of this article and provided immeasurably valuable feedback. As hoped, one of you encouraged a conservative, even-keeled approach to the content and tone; the other pushed for transformative accountability and reform. I hold you both in the highest esteem and deeply admire the values and ideals you each model. Hopefully this article found the sweet spot and did right by both perspectives. The views and opinions expressed in this article are those of the author and do not reflect those of past sponsors, speakers, collaborators, volunteers, or other individuals involved with Shaken & Stirred. © 2019 Shaken & Stirred. All rights reserved. The views and opinions expressed by presenters in this program are those of the person presenting and do not necessarily reflect the official policy or position of the sponsor or I/O Shaken & Stirred.